His Highness Sheikh Mohamed bin Zayed Al Nahyan, Crown Prince of Abu Dhabi and Deputy Supreme Commander of the UAE Armed Forces and Sheikh Hamdan bin Mohammed bin Rashid Al Maktoum, Crown Prince of Dubai, today joined community members in the 'Walk Together' march, organised by the Higher Committee for the Special Olympics World Games 2019, at the Umm Al Emarat Park in Abu Dhabi. The initiative aims to support people of determination and empower them to be integrated into the community, especially in sports, while raising awareness about the importance of voluntary work. 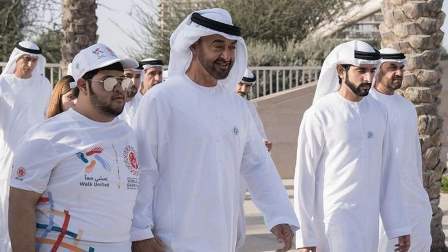 Sheikh Mohamed, who was joined by his sons and grandchildren at the event, expressed his happiness at participating with the people of determination and members of the public in the key initiative, which, he said, "motivates activity and vibrancy in us, and urges us to adopt sports as a lifestyle." "The initiative is a message and an eye-opener to the community that sports can bring entertainment, harmony and healthy lifestyles together," he stressed. Sheikh Mohamed said that he was pleased to see the positive participation of volunteers. "Volunteerism is a civilised value and human instinct, which reflects the essence of the human being, as well as his giving and dedication to do good for people. Due to Almighty Allah, this instinct is deeply embedded in the UAE community, and we are seeking to deepen it through a series of national programmes. The Walk Together event calls for solidarity, love and volunteerism," he added. He highlighted the fact that practicing a healthy lifestyle starts with conviction and desire, and should be instilled by families and schools during early childhood. The march will be held every Friday from 3:00pm to 6:00pm, until March 1. Those who joined the walk included Sheikh Nahyan bin Zayed Al Nahyan, Chairman of the Board of Trustees of the Zayed bin Sultan Al Nahyan Charitable and Humanitarian Foundation and Chairman of the Abu Dhabi Sports Council, Sheikh Khalid bin Mohamed bin Zayed Al Nahyan, Sheikh Theyab bin Mohamed bin Zayed Al Nahyan, Chairman of the Department of Transport-Abu Dhabi, and Sheikha Al Jalila bint Mohammed bin Rashid Al Maktoum, along with other officials. The march aims to engage community members in sporting activities and promote a healthy lifestyle, in the run-up to the Special Olympics World Summer Games, which will be hosted by Abu Dhabi between March 14and 21, 2019.